Focus on your abilities, not your disability! This is a leadership training program, sponsored by Rotary Clubs in District 5450 and 5440 and Easter Seals Colorado, now under the governance of Rocky Mountain RYLA. This program was initiated and piloted for 3 years by Denver Southeast Rotary Club. It is designed to offer the same outstanding leadership development conference for teenagers who have physical disabilities, where attending other RYLA programs would be prohibitive. 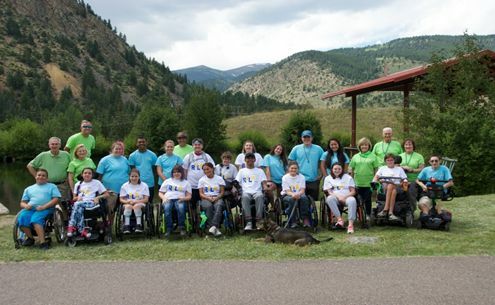 Easter Seals’ ADA-compliant camp in Empire, Colorado (Rocky Mt. Village), provides facilities and trained personnel, along with Rotary counselors, to make this conference a life-changing experience for the target population we serve. There are speakers and activities daily that motivate our conferees to understand basic principles of leadership and teamwork, while also enjoying the outdoor facilities such as the swimming pool, fishing pond, climbing wall, and zipline. The 2019 camp session will be held from mid-day Sunday, August 4 to mid-day Friday, August 9. All conferees are sponsored through Rotary club and personal donations that are matched by Easter Seals funding. A Rotary club may sponsor a specific conferee (subject to review by Easter Seals personnel) through the RMRYLA website and does require explanation of the teen’s physical limitations to ensure we can support this conferee. Prior conferees have said this program gave them the motivation and self-confidence to pursue goals beyond their original expectations. Parents of conferees have seen changes in their teenagers as well, and Rotarians who participate as counselors are inspired by the courage and positive attitudes these conferees exhibit. Enjoy this wonderful video showing the RYLA Plus camp! We hope to see you at RYLA Plus!